Here at QAI, we’re huge on food – we love coming together to eat! Step into our kitchen on any given day and you’ll find someone’s brought a long-time favorite recipe or new kitchen experiment to share. As a diverse team of former farmers, chefs, artists and food scientists, the one thing that brings us together is our passion for organic food and the respect we have for the organic community. 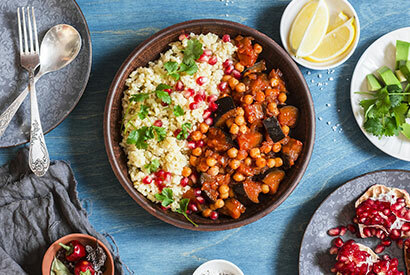 In spirit of the holidays, we wanted to share two of our favorite organic recipes that are perfect for this time of year. Please try them at home at let us know if you love them as much as we do! We hope you have a wonderful, relaxing and peaceful holiday. Packed with protein, this super delicious vegetarian dish cooks in 10 minutes. It’s perfect for a cold winter day and it makes amazing leftovers! Serve it over organic quinoa or roasted potatoes. Heat olive oil in a large skillet over medium heat and sauté eggplant until golden brown, about 4 minutes. Add the beans and spices to the skillet and mix well. Add the tomato paste, chopped tomatoes and tahini, salt and pepper to taste, stir well and simmer for 5-7 minutes until everything is completely heated through. Sprinkle with chopped parsley. 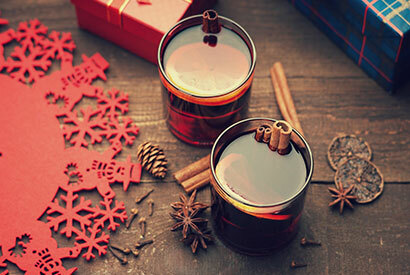 This homemade tea blend with citrus and spices is the perfect gift for friends and family. Pack it in charming tins for a quick and original holiday gift. Don’t forget to save some for yourself! With a vegetable peeler, peel the zest off the orange and lemon, avoiding the white pith. Dry the zest on an ungreased cookie sheet in the oven, about 30 minutes. Cool, then cut into small pieces. Coarsely grind cloves and cinnamon stick in a mortar and pestle. Split the vanilla pod lengthwise, then cut into 1-inch sections. Pour into air-tight gift bags or tins.